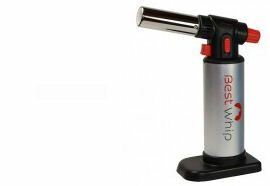 BestWhip N2O Chargers Are The Highest Quality Nitrous Oxide (N2O) Whip Cream Chargers Available. Filled with certified Linde pure N2O. No oily residues. Silver lacquered to prevent kitchen moisture from causing rust on the top of the charger. Universal (standard 8g screw-in system) fitting - not for Push-Valve (Kisag) system or new 16g system. Filled with pure Linde N2O gas in Mosa's a state of the art factory. Weighed electronically with no-duds guarantee. Will turn 1/2 litre of whipping cream into up to 1.5litres of whipped cream! Far greater a volume than mechanical whipping. Each box of BestWhip brand nitrous oxide chargers contains twenty four (24) 8 gm N2O Chargers that will fit in every whip cream dispenser we carry and that is available on the market. We ship our N2O Chargers and Whip Cream Dispensers from either our facilities in Fort Lauderdale, Florida or from San Carlos, California, depending on which ever is closer to you. This ensures fast delivery of all our nitrous oxide chargers, whip cream dispensers and soda syphons. BestWhip Nitrous Oxide Refill Cartridges are simply the best. Our customers all agree you cannot get the same high quality or value from any other manufacturer. 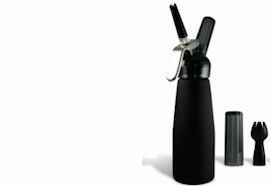 · N2O gas cartridges contain 9 Cubic cms of pure N2O at approx 60bar/900psi. · For food use only. · For use only with approved Whipped Cream Dispensers. · Non-aerosol. Non refillable. Recyclable steel. · Never dispose of full cartridges. · Keep out of reach of children. · Explosion danger: 122F (50C) max temperature. · Storage and operating temperature: 37.4 F (3 C) (minimum) 122 F (50 C) (maximum). 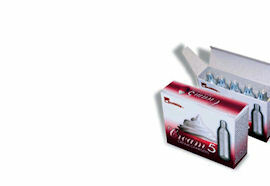 · Maximum fill pressure for cream whippers is 35 kg/cm2. · Do not take onboard an aircraft. · If you are burnt by freezing N2O you must immediately seek medical advice. A N2O burn can cause deep tissue damage which is not immediately obvious at the time of the injury. This product is not for sale to under 18's. Resellers please ensure your customers are over 18. MISUSE: Misuse of product is dangerous, harmful to your health and illegal. Do not Inhale gas! 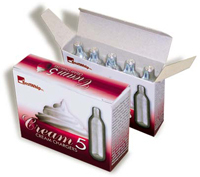 Cartridges should only be used with approved Whipped Cream Dispensers and Multi-Use Dispensers. No other devices are authorized. Whipped Cream Chargers are for Food and Beverage preparation only. We will refuse to sell Nitrous Oxide (N2O) Cream Charger cartridges to you if we suspect you intend to misuse them or are under 18. Gas cartridges are not refillable. They are made with 100% recyclable steel. They are safe to put in with your tin cans etc for collection. Please do not dispose of unused cartridges! Our gas cartridges cartridges are filled with liquified gas under high pressure. Puncturing the cartridge can cause freezing gas to escape so you may want to protect your hands and face. Ensure cartridge is empty of gas before removing from your device. Cartridges get freezing cold when punctured. If you are burnt by freezing gas you must immediately seek medical advice. A high pressure gas burn can cause deep tissue damage which is not immediately obvious at the time of the injury.